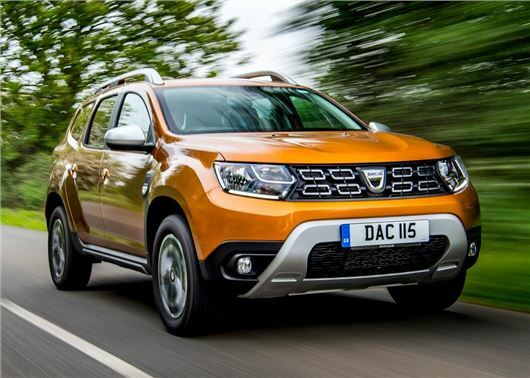 The second-generation Dacia Duster will go on sale next week - with prices starting at just £9995. The latest Duster made its debut at the Frankfurt Motor Show in September and will be available to order from Monday 11th June, with deliveries starting in July. Although Renault's budget brand describes the 2018 Duster as 'all-new', it is in fact based on the same platform as its predecessor - and you'd be hard pushed to spot the difference. Highlights include a slightly more muscular appearance, an improved interior and new technology. While the latter only goes as far as climate control, keyless entry and blind spot warning, Dacia's ethos has always been about value for money rather than the latest technology. Buyers can choose between front- and four-wheel-drive versions, with a choice of four trim levels: Access, Essential, Comfort and Prestige. Entry-level Access trim features 16-inch steel wheels, electric front windows, LED daytime running lights, stop/start and ISOFIX points in the rear. Starting at £11,595, Essential trim adds body colured numpers, manual air conditioning, a height adjustable driver's seat, DAB radio and Bluetooth. Comfort trim, which starts at £13,195, adds new 16-inch 'Cyclade' alloy wheels, a front armrest, leather steering wheel, graphite cloth upholstery, rear parking camera and sensors, electric front and rear windows, heated and electrically adjustable door mirrors and a seven-inch touchscreen infotainment system (including navigation). Top-spec Prestige, costing from £14,395, includes 17-inch alloy wheels, a multi-view camera, blind spot warning, climate control and keyless entry. Buyers get a choice of one petrol and one diesel engine at launch, made up of the SCe 115 (available with two- and four-wheel-drive) and dCi 115. Both engines use a manual gearbox. Options include leather seats (£500), metallic paint (£495) and a Western European Mapping Upgrade (£90). A spare wheel for the 4x2 version can be ordered for £150. shame their dealers are so few and far between. Where am i going to get one serviced in South Oxfordshire? Aylesbury!? You seemed to have answered your own moany question...unless you want to travel even further away...or buy something else!.